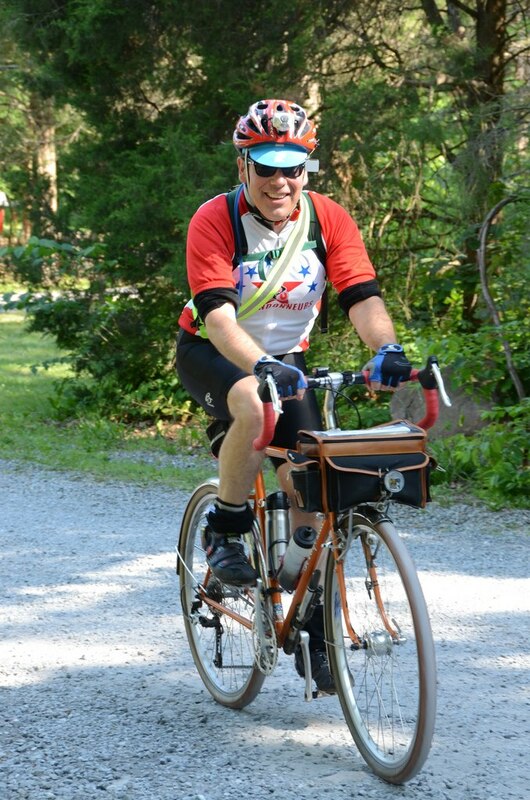 This year I had the pleasure of meeting Christian, who completed his first Super Randonneur series in 2011. I came to know Christian through his bicycle. There was something about the creamy orange paint that caught my eye; it looked like a delicious orange pushup. Intrigued by the bike’s careful setup as well as the 650B tires, I asked to feature Christian’s bike and he kindly agreed. Here’s what he had to say about his bike. I have a Molteni Orange Terraferma 650B. I like to ride on dirt, gravel, and pavement all in the same ride. The wide but fast tire options and handling of a 650B make switching between all road surfaces really easy. 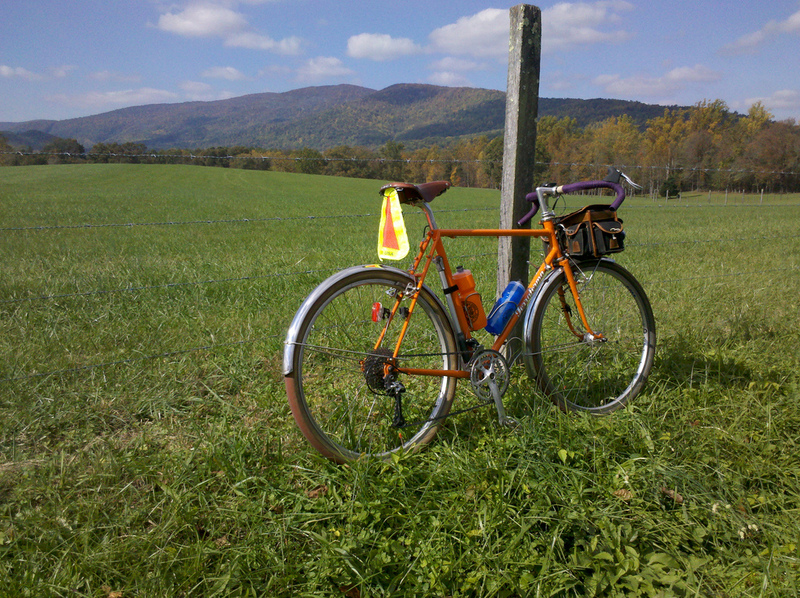 I live in Charlottesville, Virginia and ride all around the area. We have a huge network of small county roads, both paved and unpaved. One ride I especially like leaves from my house and heads north and west into Albermarle County and then climbs up Simmons Gap, via rarely used dirt roads and then a short singletrack, to Skyline Drive. Just about everything! It’s very stable at low and high speeds; the tires (42 red Hetres) really do seem to float along but also withstand a lot of punishment; the color; I love my Berthoud bag and homemade wingnut decaleur. The Terraferma was made for this road! Fenders: 50mm Berthoud stainless steel. Being more than 200 miles into the Frederick 400k and realizing that this bike is really comfortable! It was the middle of the night somewhere and for whatever reason I thought to myself: “I’ve been on this bike for something like 20 hours and I still feel good and the bike wants to keep going.” At that moment I realized I had the right bike for me. The Terraferma looks out onto the reservoir and the Blue Ridge (c) Christian M.
Hmmm? It would have to be my front rack/Berthoud bag/wingnut decaleur combo. The bag is more or less always on and is so convenient. I keep everything I need right up front. It holds everything I need and serves as a feed bag on long rides. It’s super stable on rough roads too. Mike Terraferma was great to work with; his bikes are still reasonably priced relative to other custom builders. One last look at the beautiful Terraferma (c) Christian M.
Thank you for bringing me to life. Thank you for bringing your bike to life, Christian, and for sharing a little bit about it on Chasing Mailboxes. See you on the road soon. one thing i absolutely enjoy about your postings: how you and all your randonneuring friends/acquaintances talk about your bicycles as if they are real and a part of you, a friend to you. Thanks, pencilfox. You are right; our bikes are so much a part of us! It’s hard not to give my bike a little love for all the places it happily takes me. At least, I think it’s happy about taking me around :). MG – thanks for starting up the Bikes to Like series again. 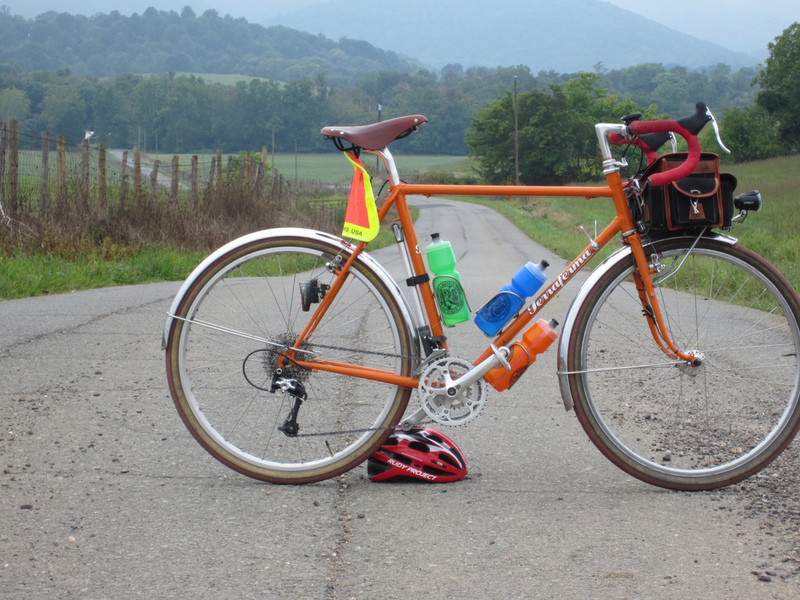 There are so many varieties of randonneuring bikes, just among the DC group. I always learn something new from checking out how someone has set up his or her machine. I’ve ridden with Christian a couple of times and enjoyed examining his bike up close. Thanks, Bob. I think it is cool to see the variety of bikes and gear people choose for randonneuring. 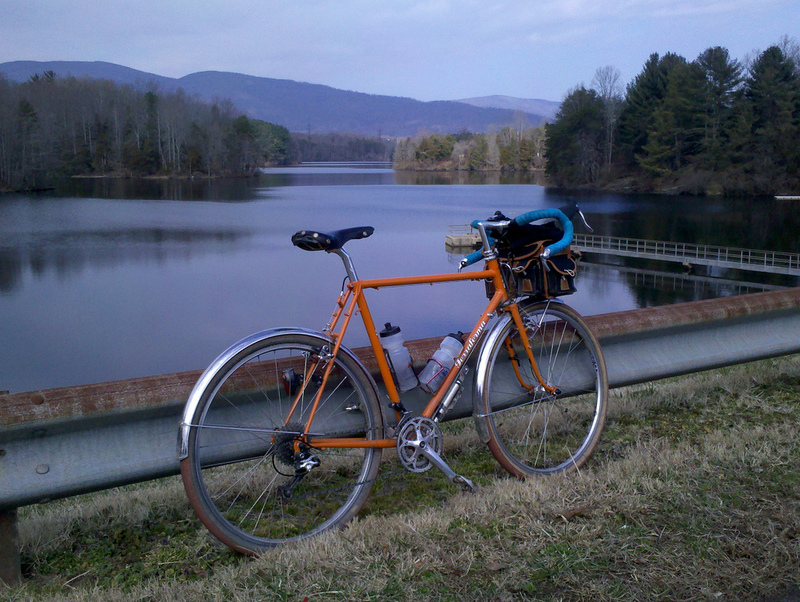 Pingback: Bikes to Like: Rick R.’s Trek Elance 300 (650B Conversion!) | chasing mailboxes d.c. I am building a Terraferma for myself….Any advise to give? What components did you choose? Anything you would change? Let me forward your note on to Christian and see if he has any response… thanks! Specifically I have three questions. First, I wanted to know how he likes the shifting… i.e. what crank and cassette he chose and how well he is able to use the big to big combination. Second, I would like to hear how he went about the fitting process. Finally, I wanted to ask how much he weighs, if he chose oversized tubing and if he likes his choice. Shifting: I have a Rene Herse/Compass Cycles 44/28 compact crank. I did have a Sugino 24/36/46. Both have been paired with a 9 speed 11/34 cassette. I much prefer the Herse crank’s gearing. I find the 44 perfect in most places and when I need it the 28/34 low is enough. The Herse is also MUCH lighter. Fitting: I sent Mike my measurements; used another bike as a reference. I tend not to think fitting is the complicated, voodoo art it sometimes appears to be. If I had to do it over again I would likely not go custom. I did so at the time as a present to myself and because the choices in 650B were more limited or I didn’t look around much or something. Weight: I checked this sometime in the last year and I weighed 170. I don’t think much has changed. I went with whatever tubing Mike thought was best but it was not oversize. I also have a Long Haul Trucker. It pains me to ride it up hills; the Terraferma is a pleasure. It’s really quite remarkable how different two bikes made out of steel can be. I am happy with my choice.